Additional research provided by Robert J. Cain, Jerry L. Cross, Gail B. Joyner, and Alexander R. Stoesen. See also: Black Tongue; Eugenics Board; Health and Human Services, Department of; Hospitals; Infectious Diseases; Medical Board; Medical Schools; Psychiatric Hospitals. From the colonial era to the present day, North Carolina has made major strides in decreasing health risks and improving the medical care of its citizenry, although compared to the rest of the country the state ranks relatively low in several public health categories. By the early 2000s North Carolina was among the national leaders in immunization rates and low infant mortality, but it was consistently average in per capita physicians, hospital beds, and other medical care facilities. Moreover, a significant percentage of North Carolinians had no health insurance. Although epidemics of typhoid fever, malaria, hookworm, pellagra, and other grave diseases are no longer a health problem in North Carolina, the state still contends with a prevalence of heart disease, cancer, diabetes, Acquired Immune Deficiency Syndrome (AIDS) and other sexually transmitted diseases, and mental illness. The health of minorities, particularly African Americans, who have higher mortality rates than whites, is a recurring concern. Similarly, since a large proportion of medical practitioners live and work in urban areas, access to quality health care remains a serious problem for many citizens in rural settings. The first public health regulation in North Carolina was a maritime quarantine law of 1712 to prevent individuals with contagious diseases from entering the province. From then until the late nineteenth century, a few rules addressed specific health problems at the local level. In 1877 the General Assembly established the North Carolina State Board of Health and made every member of the Medical Society of North Carolina a member of the board. The lawmakers approved a less-than-adequate appropriation of $100 and appointed Thomas F. Wood of Wilmington health officer on a part-time basis. In 1893, at the urging of private physicians and county health superintendents, the legislature authorized county commissioners to establish health care systems operated by a county health superintendent who either charged a fee for his services or received a subsidy from the county of $100 to $1,000 per year. At the same time, incorporated towns were empowered to raise taxes for public health, but most continued to view health matters as a county responsibility. Over time, the State Board of Health's authority was expanded. In 1893 the board was authorized to check inland waters to ensure their safety as water supplies, to advise managers of institutions and towns on their water supply and sewage disposal systems, to inspect the sanitation of public institutions annually, and to regulate the transportation of human remains on common carriers to prevent the spread of disease. By 1915 the board was supervising these activities through its bureaus on education and engineering, vital statistics, quarantine, school inspection, and county health work. The first training school for nurses was organized by Mary Wyche at Raleigh's Rex Hospital in October 1894, with five student nurses in the first class. Classes were held in a part of the hospital where patients' bells could be heard, and, if necessary, the students left the classroom to answer them. By the early 2000s, North Carolina offered 84 nursing programs that encompassed four possible educational patterns for entering the nursing profession. Five universities in the state offered courses leading to the Master of Science in Nursing degree; nurses with this credential were most often employed in advanced clinical positions or in education, administration, or research. In 1909, under the impulse of progressive reform, the General Assembly appropriated $10,500 for the state's first full-time health director, a position filled by Watson S. Rankin. Two years later it authorized counties to create their own health departments. Guilford County (1911) and Robeson County (1912) had among the first such health departments in the United States. Over the next few decades all of the municipal departments were dismantled, and public health became solely a county responsibility. The duties of county boards included quarantining, confining, or isolating patients with dangerous diseases, administering vaccinations, gathering vital statistics, and performing postmortem examinations for coroners. 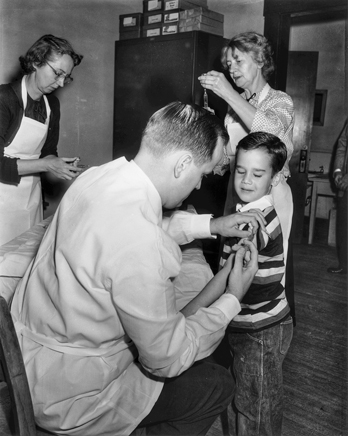 A student receives a polio vaccination on the first day they were administered in North Carolina schools, 18 Apr. 1955. Photograph by Roland Giduz. North Carolina Collection, University of North Carolina at Chapel Hill Library. 1 January 2006 | Cain, Robert J.; Cross, Jerry L.; Joyner, Gail B.; Mazzocchi, Jay; Stoesen, Alexander R.